Everyone wants the quick fix. I get so many questions from people wanting to know what’s that one miracle product that will get rid of acne, fight the signs of aging, eliminate blemishes, and let’s not forget those bags and dark circles under the eyes. Don’t misunderstand, there are some great products out there that are indeed heavy duty and will get the job done, but most of our skin fighting remedies should start with us and how we treat our body as a whole. One main problem that causes a lot of issues with skin is inconsistency. If we stay calm and consistent, our skin will behave as it should. But that’s not the main point of this post. I will save that for another day. The main point of this post is to help you understand that you can dish out millions on miracle products but until you start supporting your skin from the inside, you will not see the glowing skin you wish to have. 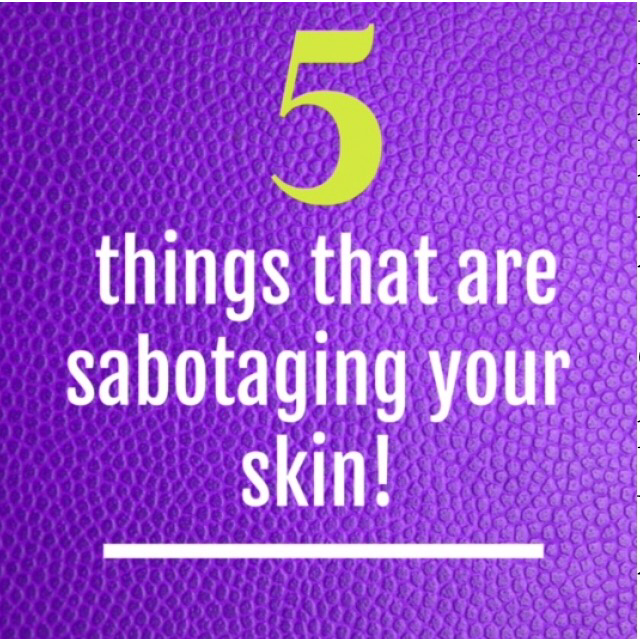 So here are 5 things that you might be doing every day that could be sabotaging your skin. They don’t call it beauty rest for nothing. Studies have proven that getting proper amounts of sleep consistently will help fight the signs of aging and can definitely help with those unsightly dark under eye circles. Yes of course there is concealer for this, but sheesh, I love waking up naturally gorgeous, don’t you? You can’t eat fries and pizza daily and expect to have beautiful skin. It might work for a while, but sooner or later, it will catch up to ya! Feed your body nutrients that give back to your body and skin. This is easier said than done, but at some point, you have to realize that you and your health are important and if you don’t make time for health, then you will be making time for illness. What are some things that make you happy that you can dive into? For me, it’s a bottle (not glass), but bottle of wine, quiet house and a darn good book. I can sit and read for hours. In the summer I never thought I would like it because I am soooooo not a bug and dirt kind of chick, but I found gardening to be extremely therapeutic. Find out what is stressing you, and start filling those stressful moments with enjoyable ones. This will take some soul searching and courage. Courage because sometimes the stressful things are people and situations that we are afraid to walk away from or simply can’t at the moment. Either way, letting your stress go unchecked not only adds years to your skin but also affects your overall health. Dirt and makeup builds up on your phone just as it does your face. Wiping your phone with an antibacterial wipe daily is just as important as washing your face. Makeup and dirt setting and festering in your face and pores all day and night sounds a little gross right? Absolutely! Clogged pores can lead to acne and gross flaky skin. Keep the dirt off and exfoliate so the glow will show! Tip: Keep makeup removing wipes at your bedside. Using those, are better than not cleaning your face at all. Follow @jayspreciousciouscargo on IG for tips, masks, and so much more concerning your skin and how to keep it beautiful.